Our mission is to enhance the quality of life by maintaining order, protecting life and property, and reducing the fear of crime. We are partners with the community in identifying needs and solving problems while respecting the constitutional rights of all. 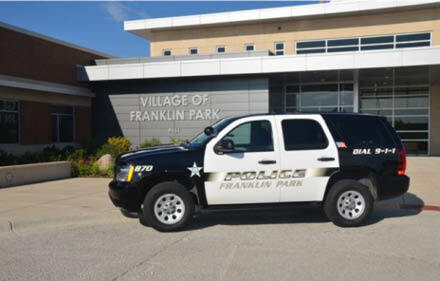 The Franklin Park Police Department is comprised of forty-six (46) full time sworn officers. This includes the Chief, one (1) Deputy Chief, two (2) Commanders and six (6) Sergeants. The Department also utilizes twenty-six (26) Part Time Auxiliary Police Officers. The Police Department's records personnel and 911 dispatch center employees are contracted out with NORCOMM. Overnight Parking Permits: Overnight parking permits can be purchased at the Police Department. The cost of the pass is $1.00 per night or $20.00 per month. Please be sure to have the address in which you will be parked and all of the vehicle information including the plate number. Metra Parking Passes: Monthly parking passes can be purchased for $25.00 at the front window of the Police Department. If you choose to pay daily, either you can pay at the box or go to parkmobile.com and pay from your cell phone. Child Safety Seats: Our Department offers inspection or installment of your child safety seat by a trained and certified Police Officer. We ask that you call for an appointment to ensure the Officer is on duty. Freedom of Information: Anyone wishing to obtain a copy of a police report can file a Freedom of Information (FOIA) on line through the Clerk's Office. Traffic Crash Reports: Anyone wishing to obtain a copy of a crash report can go to docview.us.com. Solicitors: Solicitors are not affiliated with the Village of Franklin Park and must obtain a permit through the Police Department. All solicitors are to comply to the hours of 9:00 am to 5:00 pm. No soliciting on Sundays or Holidays. Buying and selling over the Internet has become very common, but don’t leave yourself at risk! Providing your home address to unknown persons or completing transactions in an unfamiliar area is a safety concern. The Police Department recommends conducting the transaction in a safe location. Residents and business owners, who buy and sell on Craigslist, Facebook Marketplace or other exchange sites, can transact in the parking lot or lobby areas of the Police Department. The parking lot and lobby areas are monitored by staff and security cameras 24 hours a day and are well-lit in the evening. Also, only accept cash or a cashier’s check for the sale. Personal checks carry some risk.